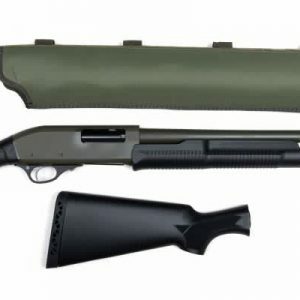 Remington 870 Express, 12 ga, 28″ Vent Rib Barrel, Synthetic Stock. Like all Model 870 shotguns, this workhorse features a receiver milled from a solid billet of steel for maximum strength and reliability. The silky-smooth twin action bars prevent binding and twisting so that you’ll always have the chance to get off a second shot. Appropriately dressed for the hunt and not for the wall, each shotgun sports non-reflective black matte metalwork and a no-frills laminate stock and fore-end. This 12 gauge model is offered with a 28-inch vent-rib barrel with a Modified Rem Choke and single bead sight.